DEUTZ type 2012C 4,038 cc, direct injection, liquid cooled, TURBO INTERCOOLER and exhaust emission in compliance with the (COM2) EU-RL97/68 EG-EPA NONROAD TIER 1 regulations. Max Power: kW 95 (130 HP) at 2,200 R.P.M. Max torque 493 Nm at 1,500 R.P.M. Clark Hurth, both steering and driving, with epicycloidal reduction gears on the hubs; the fore one is fixed and the rear one is swinging ±10°. Self locking differential on rear axles, on fore axles as well on demand. Swing locking on rear axles by electric control. Multiple disk brakes, in oil bath inside the axles. Service brakes: on the four wheels with pedal servo-assisted control. Parking brakes: on the front wheels, by electric control. Aid brakes: on the front wheels, by electric control. While operating, the brakes are used only when a bigger braking effort than the one provided by the hydrostatic transmission is required. Min. steering radius - inner part of the tires 2,100 mm. External tires min. steering radius 4,500 mm. Min. turns for total steering wheel 3.5. Either bulldozer blade or two fore outriggers on the standard version. Two central outriggers more (on demand). Each outrigger is independent from the other and is electronically controlled. Rexroth piston pump with variable delivery capacity and constant power adjustment for working operations at an oil flow of 197 lt/minute. Working pressure: 280 bar. The full simultaneous movements are granted by use of "LOAD SENSING" proportional valves that, coupled to the two variable displacement pumps allows to reset the pumps' displacement when no operative movement is required. Hydro-guide 'LOAD SENSING" and swinging gear pump with delivery capacity 24 + 24 lt/min. Working pressure 200 bar. The working controls are servo-assisted with two cross manipulators directly on the armrests of the chair. The controls of side excavation and supplementary use can be selected by means of an electric push-button on the manipulators. 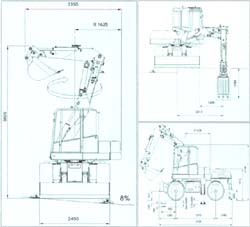 The second boom is servo-controlled by means of a pedal and can be inverted with the supplementary use control, thus allowing the operator to control the supplementary use from the pedal and the second boom from the push-button. 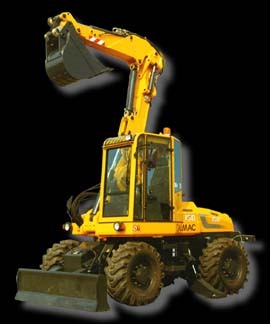 The operation of the first arm, second boom, rotation, excavating boom and bucket have priority. 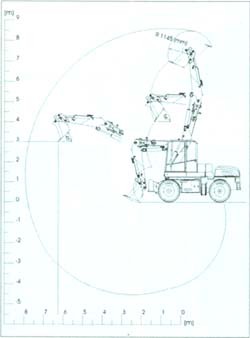 The operation of the bucket can be inverted by means of a selector. 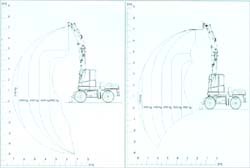 The control that opens and closes the third boom can control the simultaneous opening and closing of the second boom at the operator's discretion. 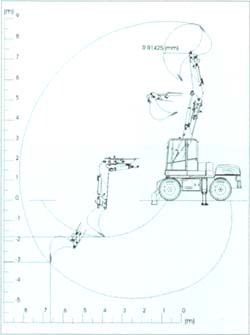 Forward-reverse gear manipulator with the loader function. The operation controls of the stabilizers and fast tool fitting are electric and independent. The windows all over the cab, including the ceiling, grant the complete view in all directions, and the opening of the door and the window on the rear side offer the aerification. The driver and maneuvere comfort is given by the ergonomic seat and by the regulation depending on the weight and height of the operator; moreover by the checking instruments of the lighting system both for the traffic and for working. The front windshield wiper with electrical glass-washer, the rotating lamp, the rear view mirror complete the standard equipment of this machine. N.B. When the machine is equipped with forks or height adjustments hook, it is necessary to apply four anti-fall valves.